Debating which type of fence to install in your yard? There are a ton of great options, but there are a few reasons why an ornamental iron fence may be the ideal choice. Wondering if you should invest in an iron fence? Keep on reading to find out why it might be worth your while. Iron fences are known to provide a little added security to any property. They can keep unwanted guests and animals from entering, and are the perfect option for private homes and apartment complexes. Many people think that because ornamental iron fences are aesthetically pleasing, that they’re unable to withstand a variety of environmental conditions. On the contrary, one of the best features of iron fences is their strength and durability; they’re even rust-proof. This means that they can withstand cold temperatures, wind and rain storms, and their coating can survive even the most humid of summer days. Iron fences are highly versatile, and can be customized to your liking; you won’t be limited to just a few options of colour and height. You can choose from a variety of styles, settings, and door options to make you fence fit in with the overall aesthetic of your building or property. Ornamental fences are designed to not only fit in with a property’s particular aesthetic, but enhance it. You can use the customizability to make your property even more attractive than it was before the fence. Any fence company will tell you that ornamental iron fences are among the lowest maintenance fencing options you can find. When you have an iron fence installed in your front yard, you won’t have to add other things to your to-do list. They’re designed to be virtually maintenance-free, so you won’t need to worry about it wearing down or getting damaged because you aren’t taking care of it. This means no re-painting, re-sealing, or even cleaning. 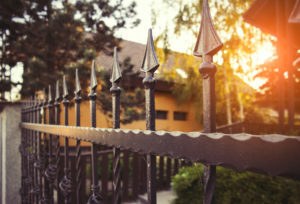 Occasionally, you might want to hose it down if it gets dirty, but other than that, an ornamental iron fence won’t be a hassle when it comes to upkeep. Why You Should Choose Total Fence Inc. Choosing which type of fence to install in your yard can be a daunting task, but fortunately your decision is easy when it comes to selecting an ornamental iron fence company in Toronto. Total Fence Inc. has an incredible team of experienced staff members that will work to ensure that your project gets completed quickly, with quality in mind. We use high-grade materials for all of our jobs, so you can be confident that our skills aren’t the only thing that’ll make your ornamental iron fence long-lasting. Total Fence Inc. is the idea fencing company that’ll ensure your home improvement investment lasts a lifetime. Contact us today to learn more about our services, or to get a free quote.